The one in the front row on the right (Barholomeus) inspired me, when he showed it's face on the chopping board. So a spontanous quick shot of this bunch. *Peperonata is an Italian mixture of sweet peppers, tomatoes, onions and garlic slowly cooked in olive oil. It's served hot as a condiment with meats or cold as an antipasto. And thats what I do now,... preparing a peperonata. LOVE THIS!!! What a delightful image! too hysterical! I get such a halloween vibe from this! :) And it made me smile. 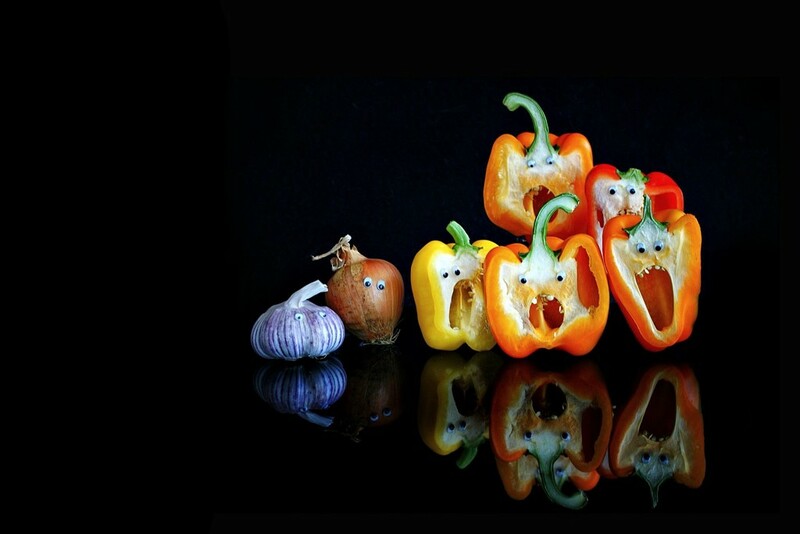 That pepper on the right could be the main feature of re-make for Edvard Munch's "The Scream"!!! Glad they got a little backup from the onions. Quite creative. Their placement in the space is quite pleasing. Love it -- they're so expressive. Fave. So cool and super creative! ( wish I thought of this. lol ;) ). Fav! Absolutely fantastic, a huge fav. so creative. Wow. Just wow. What a great fun, clever, image! Wow what a cute food shot Mona! Congrats on #1 onTT this week!